- Holding down shift accelerates your movement around the page, extremely useful when using the straightening tool and crop tool. - [ and ] change brush size. You can also hold down the ALT key, right click then drag mouse left or right. - Use the scroll wheel to move around the page vertically, hold down CTRL while using the scroll wheel to move horizontally. This is extremely useful when zoomed in. - Hold down the ALT key and use the scroll wheel to zoom in or out on the area your mouse is over. - Binding the Burn tool and Dodge tool to separate keys helps speed up work flow. - Binding the ruler tool to a key will take out many unnecessary clicks. As a note: We will be saving all of our pages in the .PSD format (Photoshop's native file format), because it saves colour mode data, image resources, Layer and Mask Information, and image data. Start off by taking a look the different file types contained in this raw-package. .JPG - (Joint Photographic Experts Group. (.JPG file extension, pronounced Jay Peg). This is the right format for those photo images which must be very small files, for example, for web sites or for email. By now you must be asking Why we have raws in so many different file formats. The reason is more simple than it should be: the person scanning the book chose that file type. Scanners have presets that they prefer and as cleaners it's our job to be able to accommodate many different types of images. - Indexed color is a technique to manage digital images' colors in a limited fashion, in order to save computer memory and file storage, while speeding up display refresh and file transfers. - RGB refers to a colour mode that makes use of the additive colour system (made up of red-green-blue). - Grayscale, as the name infers is a mode where all colour data is discarded, you are left with blacks, whites and shades of gray. It is extremely important that you do not attempt to work with an image in indexed colour mode, if you try to straighten the image it will come out extremely jagged and will look disgusting regardless of what you do to the image beyond that. For cleaning volume scans (tankoubon) we will be working exclusively in grayscale, as additional colour information could leave blacks and whites tinted with another colour as a result of the scanner or original printing. Grayscale mode, since it discards colour information, has a much smaller filesize than RGB making it ideal for passing files amongst team members. Changing between image modes is an action performed extremely regularly. You'll see that I have changing to Grayscale and RGB modes bound to custom shortcuts, this makes workflow easier in my case. Adding on to what the above image said, when using the high pass filter try to keep the radius value low (I almost never have to go above 1.0). Changing the high pass layer's mode can help with increasing contrast (helping our cause), I like to have it set on overlay for the most part. - Situational: If the page edges are warped (happens frequently with automatic document feeding scanners) crop to the outer most edges without cropping part of the image out, select the page, Ctrl+T to warp, hold down Ctrl+Shift while grabbing a corner then pull it outwards until you're left with only the page's contents within your page borders. - Duplicate the base layer. Do all further editing on the duplicate layer. This is useful if along the way details get blurred/destroyed/overleveled, you can always go back to the raw and recover. Should I really use the High pass filter @ 10 pixels? Is this Sharpening step still part of the cleaning process? 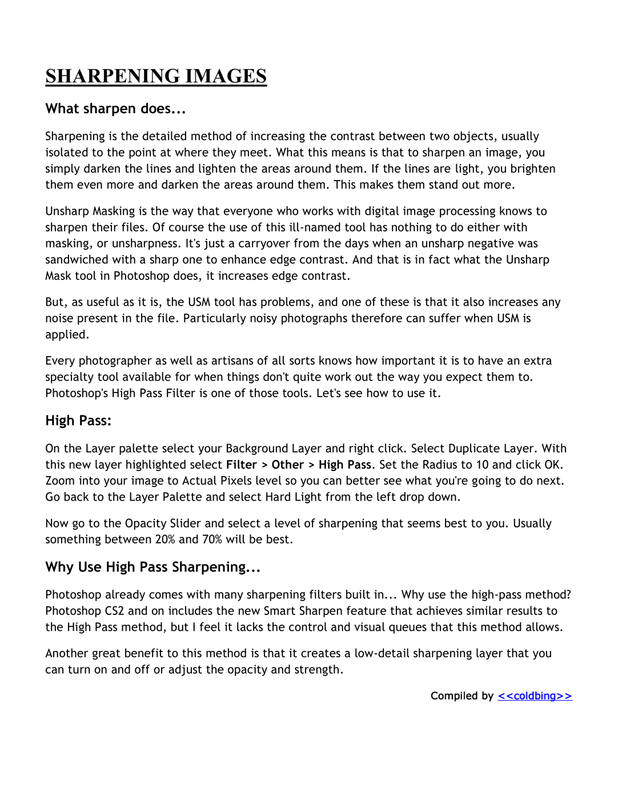 Or should I only apply sharpening using the method mentioned in the Volume Cleaning Process: "Sharpen the page (unsharpen mask 60-80%, 0.9)"?